Lemon GreenTea: Get P5,000 plus worth of freebies at the OPPO F5 Carnival Roadshow happening today! 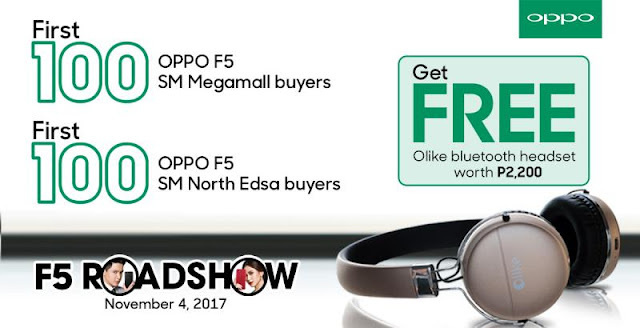 Get P5,000 plus worth of freebies at the OPPO F5 Carnival Roadshow happening today! Be the first to experience the OPPO F5 at SM City North EDSA and SM Megamall with OPPO’s very first carnival-themed roadshow and get a chance to win a premium bag worth Php71,000 for every purchase of the OPPO F5! One lucky winner will be announced weekly for the whole month of November. OPPO Philippines recently launched the new F5 smartphone with its groundbreaking A.I. Beauty Technology and gorgeous 6” FHD+ Full Screen Display. With an impressive impression from the local media and widely accepted pre-orders nationwide, the newest #SelfieExpert smartphone is ready for its first day of sale starting November 4 nationwide. Exclusive freebies worth Php5,000+ for early bird purchasersTo welcome the first day of sale of the F5, the first 100 purchasers at SM City North EDSA Annex and another first 100 purchasers at SM Megamall Building A Event Center will get exclusive gifts on the spot – an OLike Bluetooth Headphones worth Php2,190 and an Olike Bluetooth speakers worth Php2,990. This exclusive offer can be availed from 10 AM to 1 PM of November 4, 2017 or until supplies last. Experience the OPPO F5, the Carnival way!Catch OPPO influencers Alex Gonzaga and Ronnie Alonte at SM City North EDSA Annex with the new OPPO Carnival experience and the opening of OPPO’s newest concept store. Join the exciting festivities that OPPO has prepared – shoot like a pro at the F5 Hoops booth, sing your heart out at the F5 Karaoke booth, play racing games, capture beautiful and candid moments at the Selfie-Go-Round, get instant freebies, and even take a beautified selfie using the OPPO A.I. Beauty Technology of the F5. The OPPO Carnival Roadshow will also be visiting SM Megamall A Event Center from November 3 to 5, 2017. Joining the fans for a more festive mood on November 4, 2017 are OPPO ambassadors Coleen Garcia and Sanya Lopez. To top it all off, OPPO will be giving away one brand new OPPO F5 per location at the end of each roadshow for all fans who get to visit all booths inside the Carnival.OPPO’s Biggest Prize Yet – Premium Bag giveaway! Get a chance to win a premium bag worth Php71,000 for every purchase of the OPPO F5! One lucky winner will be announced weekly for the whole month of November. Customers simply have to visit www.capturetherealyou.ph to submit their entries online and qualify for the promo. “Now that the holidays are fast-approaching, our offers to our customers just keep on getting better. With freebies amounting to more than Php5,000, plus a chance to win a luxury bag weekly, now is truly the best time to purchase an OPPO F5.” said Stephen Cheng, Brand Marketing Manager, OPPO Philippines. The OPPO F5 features the groundbreaking A.I. Beauty Recognition technology that learns the face of its subject based on age, gender, skin tone and skin type, giving the OPPO F5 better beautification fit for the subject’s face with more than 200 recognition facial points and producing more attractive and natural-looking selfies. The OPPO F5 also features Speedy Facial Unlock, a new method to unlock your phone using your face as fast as 0.4 seconds, and an improved user experience with its new 2.5GHz Octa-Core processor, 4GB RAM and new Color OS 3.2. On Sale Starting November 4Priced at Php15,990, the OPPO F5 will officially be out in the market on November 4, 2017 in all OPPO stores nationwide. For more information about the OPPO F5, please visit www.oppo.com/ph/smartphone-f5 and check out the OPPO Facebook page for the latest update via https://www.facebook.com/OPPOPH/.